The 2009-10 Minnesota Timberwolves were absolutely terrible. There really isn’t any other way to put it when a team finishes the season 15-67. The Timberwolves have some nice young talent on the team, but they have struggled mightily to defend against solid teams. Minnesota gave up an astonishing 107.8 points per game. That was bad enough to rank as the second worst defense in the NBA. It also isn’t a bit helpful when you lead the league in turnovers, at 16.3 per game, as the Timberwolves did last year. This is a team that has a lot of work to do if they want to contend in the Northwest Division. The biggest offseason moves made by the Timberwolves were the trade of Al Jefferson and the trade for Michael Beasley. Jefferson was previously the go-to guy for Minnesota, but they decided it was time to part ways with him. Beasley was the second overall pick in the 2008 draft, but the Miami Heat got rid of him to clear room for the their new star trio. Wesley Johnson is a versatile forward who should fare well in the NBA, but he’ll need some time to adjust to the new style of play. Luke Ridnour was brought in to start at the point guard spot until Jonny Flynn recovers fully from his hip injury. Perhaps the most interesting newcomer to watch is Nikola Pekovic. Pekovic was the first round draft pick for this team in 2008, and he has had a lot of success overseas. There are several new faces on this team, but it’s hard to imagine any of them making a huge difference immediately. 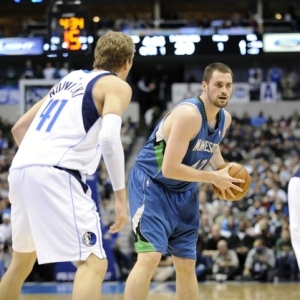 The Timberwolves have an impressive youngster in Kevin Love, who played very well as a rookie. The loss of Jefferson will allow Love to take on a bigger role, which could end up helping the Timberwolves in the long run. Jonny Flynn is a guy who gives great effort, but he doesn’t appear to be a natural point guard. Minnesota fans wish that Ricky Rubio would hurry up and come over to play for their team so they could shore up the backcourt. Darko Milicic was resigned over the offseason as well, but that move could be considered quite confusing, since this team has plenty of other talented young players at his position. David Kahn made the right move by making Love the face of this team, but there are far too many question marks to expect a lot from this team this year. The Minnesota Timberwolves schedule for this season has been released. With a team in rebuilding mode like this one, it can be tougher to say which games will be the most intriguing. The Nov. 27 home game against Golden State should be a shootout of epic proportions, since neither team plays any defense. Starting Dec. 11 the Timberwolves have a six-game road trip, which includes games at Chicago and Phoenix. The books are definitely low on the Minnesota Timberwolves going into this year, and I can’t blame them a bit. The Timberwolves are listed at +5000 to reach the Western Conference Finals, and +10,000 to win the Western Conference. What about their chances to win the NBA Championship? BetUS currently lists Minnesota at +20,000 to win it all in 2010-2011. The Timberwolves have essentially no chance of staying out of the cellar in the Northwest Division. The division is stacked, and Minnesota simply doesn’t have the horses to keep up. I think this team is taking some small steps in the right direction, which should mean a small increase in wins this year. I expect Minnesota to finish somewhere around the 22- or 23-win mark this year. Minnesota is the only team in the Northwest Division that really has no shot at all to win the division. Timberwolves fans may see a little bit brighter future on the horizon, but don’t go wagering any money on this team to win in 2010-11. Allen Eastman was the Doc’s Sports Advisory Board leader for NBA picks last season, helping $100 bettors earn more than $5,000. His picks will be available starting Tuesday, Oct. 27. Eastman has been in the sports betting business for decades and his NBA handicapping system is a must for any NBA bettor that is serious about making money this season. Early Bird specials will be posted soon, so check our homepage regularly. Also, check our home page daily updated NBA lines, NBA betting articles and daily matchup reports.